"When we lose cadres in battles we strengthen our will to hit back at the enemy. The Tsunami losses are different, especially the loss of children has shaken us deeply. I have seen mothers carrying dead babies in their hands who refuse to accept that they are dead. They continued to kiss and caress them as if they were alive. 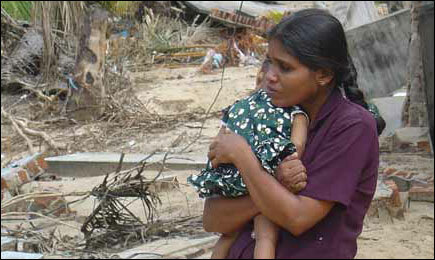 This has been a difficult time for us," said Ms. Thamilini, the head of the LTTE’s women political wing talking to TamilNet correspondent in Amparai after the Tsunami disaster. A young mother with her baby looking upon her lost home. Ms. Thamilini described the impact of tsunami, the relief work done by the female cadres and the needs of people in Amparai, the worst tsunami affected area in Sri Lanka during the interview. She said the media was irresponsible to spread unconfirmed rumours about LTTE recruiting child soldiers among the affected people. She blamed the security forces for trying to interfere with the relief work in Tamil areas. She also said that the Sri Lankan Government has missed a valuable opportunity to build confidence among the Tamil people by failing to distribute relief aid equitably. TamilNet: When did you decide to get involved in the relief effort? Thamilini: Immediately after the tsunami hit northeast coastline, our national leader instructed all of us to get totally involved in the rescue and relief work. We came to the east. When we arrived in Batticaloa, the district political section head has already begun the relief work, so we quickly moved to Amparai district. Most of the Tamil people in this area live along the coastline. The destruction is enormous. Many villages have completely disappeared. When we arrived people were still scared of the sea and they will not stay in one place, they were constantly on the run. Eventually due to the fear that the tsunami will hit again people moved to higher grounds on top of hills. Because it rained continuously in the east after the tsunami, especially in the Thirukovil area, bridges have been destroyed and roads have disappeared. Arukambay bridge between Thirukovil and Komari was destroyed. Mukaththuvaram between Akkaraipattu and Thirukovil is under water. Therefore, many organizations that were providing assistance at that stage were unable to reach the Thirukovil area. People did not receive sufficient relief. Once we arrived we got the assistance of the local Tamil Rehabilitation Organization (TRO) and collected sufficient relief material and went to those areas that were inaccessible by roads and assisted the people. Once the rain receded and the roads were passable other organizations came and started their relief work. Komari and Vinayagar villages in Amparai district are sites of widespread destruction. Displaced people here are housed in temporary tents and schools. Many NGOs are providing help. TRO is taking care of the feeding the people. TamilNet: How do you ensure equitable distribution of aid? Thamilini: We identify the needs of the people and communicate it to the NGOs so that aid is distributed equitably. Without such coordination, people with physical strength and help fight for the aid and get more than what they need while the weaker people do not receive sufficient relief supplies. This is what people first complained to us about when we arrived here. We have created a registration system with the needs of people and are ensuring that everyone is receiving what they need. Muslim women in Saythamaruthu and Kalmunaikudi came to us and said that relief items are coming from many corners but they are not reaching the affected. They told us that it was only LTTE that can ensure an equitable delivery of relief items. We have involved religious leaders in Saythamaruthu to distribute the relief. We don't differentiate between people and religions. We have a common uniting factor. We felt strong unity and comradery as Tamil speaking people. We are involved in a huge humanitarian work. We must ensure that Tamil and Sinhalese receive fair distribution of aid. It is the instruction of our national leader that we should not differentiate among people. TamilNet: What are the special needs of people in the camps? Thamilini: Women and children have suffered severe devastation. They have lost many members of the family. They have many special needs. Our female cadres are working in all welfare camps and they are making sure that the needs of women and children are met. The female cadres are paying particular attention to children under the age of 12, pregnant mothers and nursing mothers. Many NGOs are giving medical assistance to pregnant mothers. Female cadres trained in medical help are also involved in this work. They have given pregnant mothers a full health check. They also provide them with treatment and medical advice. We also ensure that pregnant mothers are receiving adequate nutrition in their diet. Nursing mothers are also given special care with regard to nutrition ensuring milk powder or dhal are included their diet. We also give physical help to these mothers to do their chores. Children are living in tents and schools that are very crowded. The rain has brought added difficulties. The rain has eased now. Children need footwear because they will not stay in one place and want to run around often injuring their bare feet. We are working towards getting footwear for the children. Books washed away by the Tsunami waves. People from the 'Arangalaya' group from Vavuniya entertaining the Tsunami affected children living in camps at Amparai and Thirukkovil. We also need to move on to the next phase of the relief work. Children's education needs to be taken forward. They have lost their books and stationary. Creating a happy environment for children's education is one of our primary aim to help them forget the scars of the disaster. In the phase I of this work, female cadres are organizing preschool classes in the camps with teachers who are also in the camps. Children are being taught to sing and dance. TamilNet: Is all the aid coming in are being put to use? Thamilini: Many organizations are giving old clothes to the affected people. As you know our people are culturally sensitive to what type of clothes they wear. They will not wear clothes that are sent from foreign countries and modern clothes. They ask for clothes that they are used to wearing. We are trying to get these for them. We tell those who wish to give clothes that even if it is fewer number of clothes to please give new clothes. TamilNet: What are the urgent needs? Thamilini: There is insufficient number of toilets for the people. There is not enough clean water in many places. We have to put water reservoirs and pumps to provide clean water. These are the immediate challenges. TamilNet: NGOs have been warning about violence against women in cams. Have you come across such violence? Thamilini: The living condition of women in welfare camps is not very safe due to the crowded condition. We have seen intoxicated people harassing women. We are bringing this situation under control. Importantly we are trying to create awareness among the people in the camps to be responsible for their own safety as a group. We have setup safety committees among the people in camps. TamilNet: How are you coping with the psychological traumas of people. Thamilini: People have to struggle to ensure food and safety for themselves and for their surviving family members. They have not had the chance to cry out loud and grieve for those they have lost. They have not had the solace one receives after loosing a family member if they had lived in their own homes. What we are seeing are people who are not showing the usual concerns for their family members because they are unsure of their future. In other words they are unable to carry out their family responsibilities. We are also taking on the tasks of ensuring that people are eating regularly and taking care of themselves. When we visit them they cry and talk openly to us. One old man who lost four children when asked by our female cadres "How are you dad?" felt deeply consoled. He held the cadre's hands and cried for a long time and said, "many people are coming and going. Ministers are coming. No one came looking for us. Only you come looking for us." He said he is an orphan now. We told him that he is not an orphan and that we will look after him. We told him that our leader has instructed us to be with our people. He asked us to thank out leader for this. People are facing many types of psychological traumas. Students from tertiary institutions in Jaffna and Batticaloa are regularly visiting camps and talking to the adults about their traumas. Psychiatric professionals are also helping the people and training us to be more effective in our work with the people. TamilNet: Are people keen to move back to their homes? Thamilini: People have said to us that they would like to go back to their homes. There are many problems facing them here. In some places homes are completely flattened. In other places water has entered up to the roof. In other places water has gone in only a few feet above floor. Those who can get back needs to clean up, pump the salty water from the wells and chlorinate it. Our cadres are also helping people in the cleanup. 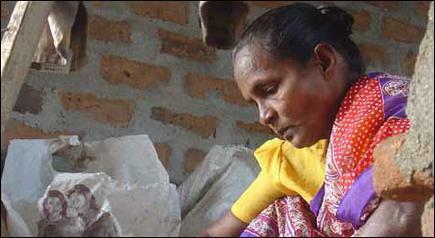 A mother struggling hard to rebuild her life. Those who have lost their homes cannot get back at least for another six months. They cannot get back to the same location of their home as many livee very close to the coastline. We must now allocate land 300 metres away from the coastline and build homes for these people. In the meantime we need to provide temporary shelters and also run schools for the children in the temporary shelters. We are taking actions towards this. TamilNet: Do you have hope of receiving aid channeled through the government? Thamilini: We read from newspapers that the Sri Lankan government is receiving lot of aid from other countries. Will this aid reach the Tamils? This is a big question not only in our minds but also in the minds of our people. People ask us whether they will get some of that aid. We are unable to answer their question. We have observed Sri Lankan government actions after the tsunami. For example, UN Secretary General Kofi Annan should have seen the horrendous devastation faced by the Tamil people. The Sri Lankan government blocked his visit to Tamil areas. The government is keen to block news about the devastation in Tamil areas reaching the outside world. We are losing confidence in the ability of the Sri Lanka Government to provide adequate aid to our people to build back their lives. Our people have no confidence either. We do not want to falsely raise the hopes of our people that this aid will reach us. We tell our people that our kith and kin living around the world have come to our aid generously and that we are hoping that they will continue to help. We tell them that expatrite Tamils around the world are grieving with us and they will rise to the challenge in helping us. TamilNet: How are you working with the armed forces in the welfare camps? Thamilini: Sri Lankan government is frustrating us continuously in our relief by creating unnecessary hurdles. They have stationed fully armed security forces in all welfare camps for 24 hours. For example, people from Vinayagar village are displaced in schools in Sinnathoddam and others. When our cadres with local Grama Sevakar and TRO workers went in vehicles to give relief supplies the security forces took over the vehicles, dropped us at the STF camp and took the relief and distributed it in a most disorderly fashion. One female cadre who was helping the people at the welfare camp was chased and beaten. The Sri Lankan forces are continuously interfering in our work in order to hamper our relief efforts. This is a very serious situation. A child being taken care of in a temporary welfare centre. I can give another example. Many children have lost their parents in the tsunami. You know that many children's homes are run in Kilinochchi to take care of children. 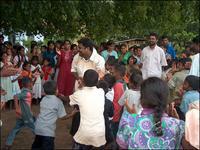 We sent some of the children orphaned by the tsunami with a caretaker to the children's homes in Kilinochchi. 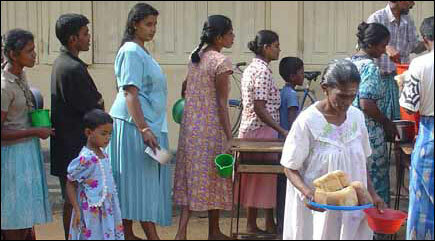 The Sri Lankan army detained the children and the caregiver and said that the children are being taken to join the LTTE. This is the most degenerate behaviour on the part of the Sri Lankan forces to frustrate our work among our people. What we like to tell the world is this. We are a group fighting for the liberation of our people. We have concern about the welfare of our people. Our cadres have dedicated themselves totally to care for our people at this time of great disaster. The irresponsibility of respected media saddens us. TamilNet: How are you coping with the trauma yourself? Thamilini: We have seen mothers who have lost the babies in their hands to tsunami not in control of themselves and unable to come to grip with what has happened. I have seen mothers carrying dead babies in their hands who refuse to accept that they are dead. They continue to kiss and caress them as if they are alive. They had great trouble accepting that the last rites needs to be performed on their babies. In Mullaitivu there was a children's home called Senthalir Illam. I have known more than 200 children in this home for a long time. I visited them often. They were healthy active children. Only 24 of them survived the tsunami. I find it difficult to even reflect on this. The loss of children has shaken us deeply and it is very difficult for us to even think about it. TamilNet: Where do you go from here? Thamilini: We must not depend on aid for long. People must be made self-reliant and independent. Mothers who have been widowed must be given training to give them skills to earn a living. We must hasten our plans to achieve this.